c2i received the Mayors Award of Dunajská Streda (its hometown) for its outstanding achievements in the field of work and social life for the community. When it comes to performance car design, weight is everything. The heavier the vehicle, the slower the speed, the more fuel it consumes. Carbon fibre is lighter than aluminium but stronger than steel, making it potentially faster and more fuel efficient. The materialâ€™s chief drawback is that it can be expensive to make. In F1, the carbon fibre is moulded by hand, an extremely labour intensive process. Now the race is on to industrialise the process for the mass market.This is where Patrick Hessel, founder and chief executive of Slovak firm c2i, comes in. When Patrick Hessel was a teenager he remembers standing on the corner of the street in New York behind a man in a wheelchair. The man was struggling to get something out of the backpack that was hung behind his seat. â€œThe poor guy was trapped,â€ Mr Hessel, now 34, recalls. â€œHe was vulnerable because the only storage space was behind his seat. He had no control. It was not practical.â€ Mr Hessel, who was announced as the Slovak country winner of the EY Entrepreneur of the Year earlier this year, set about designing a new type of wheelchair with a spokeless wheel that made it possible to access storage space underneath the seat. He designed it using carbon fibre which made the wheelchair stronger and lighter as well as much easier to fold up. Mr Hessel entered his innovative wheelchair design in a competition and came second. 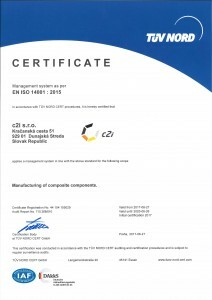 Founded in 2005 by Patrick Hessel, c2i is specialised in carbon-fibre components manufacturing and assemblies. The company has grown rapidly in the aeronautics and automotive fields due to a brand new equipment and a unique technology concentration in Slovakia. Located at the cross of western and eastern Europe, Patrick Hessel introduces for us his strategy and vision on composites. Hyperloop Transportation Technologies announces a base technology of the Hyperloop System: Vibranium, a smart material specifically developed for the Hyperloop application with C2i, a slovakian carbon-fibre components manufacturer. If it protects Captain America, then it should protect those riding the Hyperloop. Hyperloop Transportation Technologies (HTT), the company that's creating a high-speed tube capable of transporting people at speeds up to 760mph, announced Tuesday that its transportation pods will be made out of "Vibranium" in order to provide passengers more protection. If the Hyperloop succeeds at sending people and cargo through tubes at up to 760 mph, one company says the capsules zipping along at close to the speed of sound should be smart enough to immediately detect any problems.